Sarah Jane O'Keefe -- Smith Hall resident, Dylan Shanahan, enjoys his unusual job at Citizen’s Business Bank Arena. Typical working college students often hold positions in the fast food industry, retail stores or at on- campus establishments. However, some students at California Baptist University break the assumptions of college employment as they seek jobs that many may consider to be strange or unusual. Melissa Ghilglieri, junior, has worked as a family consultant at the Draper Mortuary for the past four months, where she spends her time helping grieving families deal with the loss of a loved one. Through weekly meetings, Ghilglieri is able to help grieving families cope. “Grieving sessions let friends and families talk about memories and express things they never got to say to their loved ones before they passed,” Ghilglieri said. This job not only provides a unique experience but also provides great opportunities for Ghilglieri to share her faith. “My favorite part of my job is being able to witness to people just when they need it most. In a time filled with such sadness, you can offer them hope,” Ghilglieri said. Cambria Schmiz, freshman, also has what may be considered an unusual job for a college student. After participating in gymnastics as a child, Schmiz landed a job at Murrieta Valley Gymnastics. She has spent the past four years coaching gymnastics with them for children between the ages of three and 16. 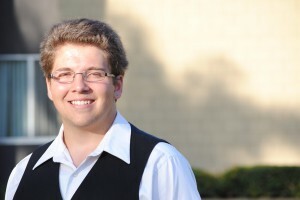 Another student who enjoys their unique job is sophomore Dylon Shanahan. He has spent the past 12 months serving as a “Jack of all trades” at the Citizen’s Business Bank Arena. Whether he is building the stage or operating lighting and sound equipment backstage, Shanahan is happy to be a part of putting on various theatrical plays and concerts. “I have always loved theatre and have always been involved in the technical aspects of it,” Shanahan said. Every new event brings with it new challenges but also provides Shanahan with new opportunities. “I like meeting the bands and performers. That’s always really cool. I plan on working there as long as I can,” Shanahan said. Whether working in food service, retail or finding employment in a more unusual environment, finding pleasure in your work can make a world of difference.